4-wheel drive helps you go but it doesn’t help you stop. Don’t get complacent just because you’ve got a 4x4. When roads get slick, slow down. Anticipate problems in plenty of time so you can brake under control. Be familiar with the type of 4-wheel drive system your vehicle has. There are so-called "part-time" and "full-time" systems. A part-time system gives you better traction on slippery surfaces because the front and rear sets of wheels are locked together, but you shouldn’t keep a part-time system in 4WD on dry pavement. This creates too much wear on the drivetrain. A full-time system lets a little slip occur between the front and rear wheels, so running it on dry pavement is ok. A full-time system is more convenient when you’re driving on a road with intermittent patches of ice and snow, with dry pavement in between, because you can just put it in 4WD and leave it there. A part-time system gives you more traction when the surfaces are covered with solid snow or ice. When the weather turns cool, think about getting your rig ready for winter. Don’t wait until the asphalt turns white to prep your vehicle. Tyres – If you’re planning to spend any significant time driving in snow, invest in a set of snow tyres. They’ll help you avoid the hassle of chains in most situations. Whatever tyres you use, you’ll get more traction and better stopping power if you have them siped – the process of cutting tiny slits in the tread. Tyre stores will do this for you with a special siping machine. Put dedicated snow tyres on your vehicle well before the first snowfall. Recent tests by Michelin show that the special tyre compounds used in the tread of high-end snow tyres need to be conditioned after you mount them each year by about 600 miles of dry highway driving before they develop maximum traction in snow. You can also use studded snow tyres, with small match-stick-sized metal projections sticking out of the tread about an eighth of an inch. Studded tyres give superior traction on icy surfaces, but they give less traction on dry pavement because they keep the tread from fully gripping the surface. If you live in a super-cold climate, you probably know people who parked their vehicles on a snowy surface and ripped the tyres right off the rims when they tried to drive away the next morning. The heat from the recently-driven tyres melted a thin layer of snow when they parked, but the night-time sub-zero temperatures froze this layer again, effectively welding the tyre treads to the ground. Fluids – Check the potency of your antifreeze before the first frost, and be sure to change your oil to lower viscosity winter-weight. Invest in an oil pan heater if you live in an especially cold climate. Don’t forget to change the windshield washer fluid to an antifreeze type. Then be sure to wash the windshield before freezing temperatures arrive, so you have the antifreeze solution in the washer lines, or else they’ll freeze solid and you won’t be able to squirt the winter grime off your windshield until they thaw in the spring. Vision – Be sure your windshield wipers are up to par. Carry windshield deicer and an ice scraper. Plan ahead so you can start your engine a few minutes before you have to leave and get the heater and defroster going. Don’t risk driving with the windows frosted over, peering through a little peephole you’ve managed to scrape clear in the middle of the windshield. Heater – A functioning heater and defroster provide more than just comfort. They provide safety by keeping the windows clear. Check them thoroughly as part of your winter prep. Battery – Don’t take a chance driving in winter weather with a marginal battery. Your battery won’t be nearly as efficient in cold temperatures anyway, and has to work a lot harder to turn the engine over when the oil’s stiffened by the cold. A dead battery in a blizzard or remote location can be life-threatening. If you’re not sure about your battery, invest in a high end new one and make sure it has plenty of CCAs. Install dual batteries if you’re going to travel to remote backcountry, especially if you anticipate having to use your winch. If you’re going to be driving any distance at all, check the weather first. Be sure you know what the weather is going to be doing all along your route. Are you going to be crossing mountain passes? A light rain in the valleys may be a raging blizzard at higher altitudes. A scenic shortcut in the summer may turn into an impassable death trap in snowy weather. Call your local automobile or travel club, or check with the highway departments or highway patrols of the states through which you’ll be traveling. An experienced pilot, taking off in a private plane, files a flight plan before he or she leaves the runway, informing the FAA of the intended route and the expected time of arrival. If the plane doesn’t show up at the destination on time, people know where to start looking. Take a hint from the pilots. It’s a good idea any time you take a trip anywhere to let friends and family know where you’re going and when you expect to be back. Also let theem know what route you intend to take. This is especially important in the winter, particularly if you’re going to be traveling off the beaten path. General stuff: CB radio to call for help if necessary (don’t count on a cellular phone if you’re out in the country), windshield deicing fluid, extra windshield washer/antifreeze solution, a waterproof tarp to lie on in the snow if you have to put on chains or make repairs. Be sure you leave home with a full tank of gas, and if you know you’re heading into bad weather, fill up anytime you get below ¾ full. Don’t forget to bring at least two flashlights with extra batteries for each. Unstuck stuff: Tire chains, spare tire with a lug wrench and jack, Safety Seal Kit to seal flat tires, a tire gauge, an electric air pump to reinflate flats, a Hi-Lift jack with a bumper-lift accessory, a shovel, a hand winch (a "come-along"), traction strips to put under wheels that are slipping, a nylon tow strap, a buck saw to cut brush to put under spinning wheels and to cut firewood if necessary. Food and water: At least a gallon of drinking water for each person, emergency food to last each person at least one day. Protection from the cold: A warm sleeping bag for each person, several extra blankets. Bring along fire-making equipment in case your impromptu stay in the outdoors lasts longer than a few hours – waterproof matches, gelled alcohol fire starter, Duraflame-type fire logs to get a fire started. Warm clothing: Warm coats or parkas, sweaters, and winter boots, along with a change of gloves, boots, socks, underwear, and pants in case your basic clothes get wet. Bring along waterproof foul weather gear for anyone who may have to be working outside on the vehicle in cold, sloppy weather. Things get a bit more complicated when you travel off-highway in the winter. You have to be prepared to survive for several days if you get stranded in a remote area, so plan accordingly even if you didn’t plan an overnight trip originally. It’s especially important to let people know where you’re going and how long you’ll be gone. Travel with another vehicle: It’s foolish to travel in a remote area by yourself. Bring along at least one other rig, so whoever gets stuck has someone to tow him or her out. If one vehicle gets disabled miles from nowhere, you have another rig available to go for help or to carry out an injured person. All the above "on-highway" stuff plus a lot more: For off-road travel, you need all the "on-highway" stuff plus a lot more. Bring along more water, food, and warm clothes. Be sure to use polypro or other wicking-type synthetic fiber long underwear. Avoid cotton clothing. Wear layered clothing, so you can adjust the layers to stay warm without getting wet with sweat when you cut wood or do other work. Wear winter hiking boots. Bring more fire-making equipment and bring along some dry firewood to get a good fire going to help dry out wood you pick up in the woods. Camping supplies: A winter tent for shelter, cooking utensils, a propane stove and propane lanterns. Tarps and rope to build shelter from wind, rain, and snow. Winch and winching supplies: At least one of your vehicles should be equipped with a good winch. 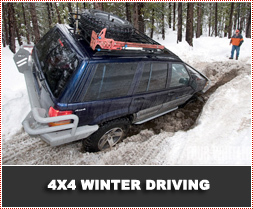 Driving off-road in the winter, you’re very likely going to have to winch at some point. (See Chapter 10 in 4-Wheel Freedom: The Art of Off-Road Driving for detailed advice on winching and Hi-Lift jack recovery techniques.) Winching supplies include D-shackles, a pulley block for double-lining the pull, several nylon tow straps, a length of chain with a hook on each end, and extra cable (to reach anchor points out of reach of your installed winch cable). Include leather-palmed gloves and eye protection. Other equipment: It’s helpful to have a 2-meter band radio available in remote areas, since you’re more likely to raise help with the longer range of 2-meter equipment. The range of a CB is too limited to be of much help in real backcountry. You need a no-code amateur radio license for the 2-meter radio, but this is very easy to get. Contact your local amateur radio club. Bring a first aid kit. (See Chapter 6 of 4-Wheel Freedom for a detailed list of suggested first aid supplies and for general survival tips.) Bring a water filter in case you run out of fresh water and get stuck somewhere without snow to melt. Be sure you have sunglasses for everyone, and bring plenty of sunblock. Bring snowshoes in case you have to hike any distance over deep snow. In remote areas you might want to have a shotgun, rifle, or heavy-caliber handgun along for protection. Bring stuff for basic vehicle repairs. Include a roll of duct tape and a tube of epoxy sealer to seal holes that rocks or sticks might poke in the oil pan or gas tank. Before you venture into backcountry in the winter, take a course or at least read some books on cold-weather survival. The first few times, travel with people experienced in wintertime camping. If you get stuck in the snow, and have to wait for rescuers in the wilderness, set up camp and build a fire. Keep enough wood cut so there’s no chance of the fire ever going out. It’s your lifeline. Stay warm by running the car engine and using the heater only until you have the fire built. If you rely on the car engine for warmth, you’ll soon run out of gas and your vehicle will turn into a large icebox. In very cold weather, you’re better off to build a shelter in the snow. Properly constructed, you can heat a snow shelter with a candle and survive for an extended length of time. If you have trouble getting a fire started, try putting a light coating of Vasoline from the first aid kit on a cotton ball, a paper napkin, or a piece of cloth. Light the Vasoline and use it to get the kindling burning. If you run out of matches, you can light the Vasoline with sparks from the battery jumper cables. Pieces of bicycle tire inner tube make a good fire starter, too. Carry some with your fire-building material. Stay with the vehicle. Rescuers can spot a vehicle in the snow better than they can spot a lone figure hiking through the snow. Keep the vehicle cleared of snow for better visibility. If you can move it, park it with the windshield facing south, to increase the chance that sun glinting off the glass will attract the attention of searching air craft. Prepare a large signal fire and cover it with a tarp. If you hear a low-flying airplane or helicopter, whip the tarp off, squirt a bunch of fire-starter on the kindling, and light it. Make lots of smoke by burning pieces of your cut-up spare tire, and put green evergreen branches and motor oil on it after it gets going. Have a signal mirror ready to attract the attention of airborne rescuers. Take the rear view mirror off your vehicle and use that if you don’t have a signal mirror available. Lay out a big "HELP" sign on the ground, using large sticks on top of the snow or rocks on the ground. Above all, don’t panic! People will be looking for you, and you can survive a long time with a snow shelter for warmth and snow to melt for drinking water, even if you run out of food. Check Chapter 11 in 4-Wheel Freedom for more information on handling your rig on snow and ice. Shift into 4-wheel drive at the first sign of losing traction. Don’t wait until you’re stuck to engage the transfer case. And remember – the cardinal rule of driving on slippery surfaces is to SLOW DOWN. Don’t get complacent just because you’ve got 4WD. Drive smoothly – no abrupt turns and no sudden braking. Be sure you know what kind of brakes you have. If you have ABS, then you need to apply firm, steady pressure to stop. If you have regular brakes, then you need to pump the brake pedal rapidly. ABS helps you maintain some degree of steering while you brake. Without ABS, if you lock your wheels into a skid, you lose all ability to steer the rig around the obstacle, so it’s important to modulate them by pumping, pushing the brake down quickly and firmly just to the point of lockup, then releasing momentarily. There are two kinds of skids to recognize and recover from – understeer and oversteer. They’re handled differently. An oversteer skid is the most common, and occurs when the rear wheels break free and skid sideways toward the outside of a curve. That points the nose of the vehicle more into the turn more than you intended – it’s steering too much, so it’s called an oversteer situation. You avoid this type of skid by slowing down well before you enter a slippery turn. You recover by recognizing it the instant you feel the rear of the rig lose traction, steering back slightly toward the outside of the turn (toward the direction the rear wheels are sliding), and accelerating just a touch. Do not apply the brakes. This shifts the weight of the vehicle onto the front wheels, and the rear wheels lose traction even more. With front wheel drive, you can be more aggressive in accelerating out of the skid. It’s easier to recover by adding acceleration with 4WD, too, but not as effective as with front wheel drive alone. An understeer skid happens when you turn the steering wheel to try to steer around a curve, but the front end just keeps going straight. The rig is steering too little, so you have an understeer condition. It can happen if you make the mistake of accelerating too much as you enter a slippery turn. The acceleration shifts the weight of the vehicle to the rear wheels, and the front wheels lose traction. Avoid an understeer skid by slowing down before the curve, and coasting around the turn until you’re well into it. Recover from an understeer skid by turning the steering wheel back toward the outside of the turn (toward the direction the front wheels seem to be sliding)and coming off the accelerator to shift weight back onto the front wheels, then gently turning back into the curve. Don’t use cruise control or overdrive on a slippery road. Either of these modes causes an automatic transmission to downshift when going uphill, and the sudden surge of power to the wheels can break your traction if the road is slippery. If the road is icy and you feel as though your rig is going to spin out at any moment, just grit your teeth and put on the chains. With 4WD, there are good arguments for putting them on the front wheels or for putting them on the rear wheels. It’s best to carry two pairs, so you can chain up all four driving wheels. When you’re traveling off-highway in the snow over unmaintained dirt roads or trails, be aware of several points. Determine the depth and consistency of the snow. If it’s too soft to support your rig, is there firm ground six or eight inches down that your tires can grip? If not, you can get high centered in a hurry, and it may prove impossible to winch free if the snow is heavy and deep. Remember that a layer of crusted snow might support your vehicle in the morning, but in the evening when you return over the same trail, the afternoon sun may have softened the surface so it won’t support you anymore. It’s important to travel with other rigs when you venture into the backcountry in snowy weather, and don’t forget the "flight plan." Be sure you have a CB radio, or better yet, a 2-meter band radio.